The llama is a domestic herd animal and is a member of the camelid family. Other members of this family are the alpaca and the wild guanaco and wild vicuna. Llamas now located in North America came from South America. The llama has been scientifically shown, through DNA analysis, to have originated from the wild guanaco. Recent research from archaeological data dates domestication at 6,000 to 7,000 years ago in the Peruvian Andes. Llama mummies have been identified as two breeds of llama, one with fine fibre and the other with coarse fibre. Today breeders again breed for these two different types of llama. Because the llama is a herd animal it is important to note they must have companionship. They can get along with one or two companions. They need to be in the company of a llama herd, or in the company of other herd animals like sheep, goats, or cattle. They can also be placed with horses if conditions are right. Horses have a hefty kick and a llama could be severely injured by a horse. The tribesmen of the Andes kept their llamas in herds, taking them to grazing land during the day and securing them in stone walled enclosures, near their dwellings, during the night. 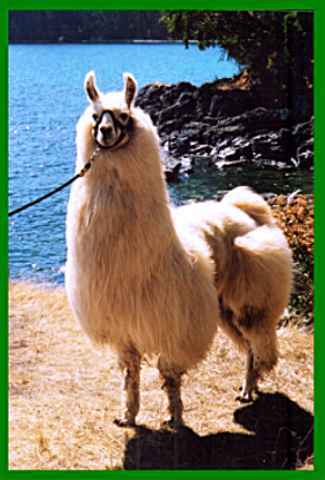 The breeding of the original Andean stock of domestic camelids came to a sudden halt with the Spanish invasion of 1533. The Spanish documentation recorded the disappearance of over 90% of all domestic camelids (llamas and alpacas) along with 80% of the native human population. The only refuge for the remaining llamas was in the extreme elevation of the mountains. 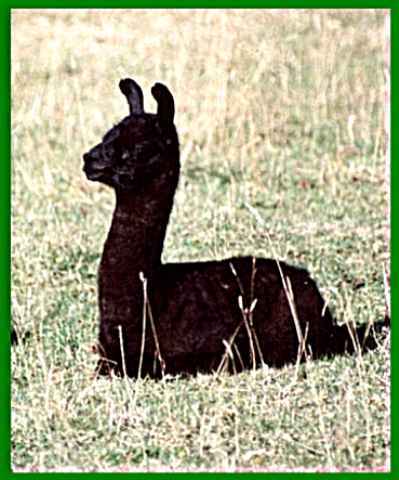 Knowledge of the development of the llama was lost along with the ability for diversity in genetics. Breeding programs and importation of animals has increased the numbers of llamas in Canada, so they are now affordable to the enjoyment of many large and small property owners. Llamas come in many sizes and shapes. Adults stand between 42" and 50" at the withers and weigh between 250 and 450 lbs. Llamas come in a variety of colours from solid to multi-tone. The fiber llamas are separated into different fleece types. Common terms to define the different fiber animals are woolly, silky and suri llamas. Each fiber type has specific characteristics and you can learn more about that in the fiber section of the web site. 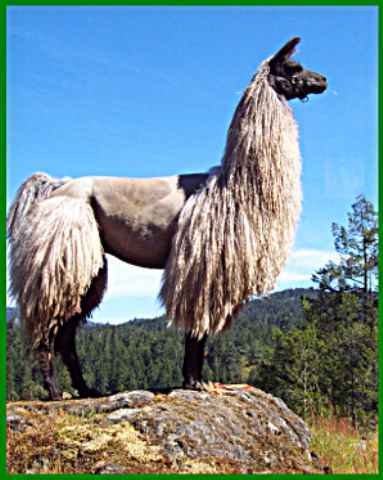 The working llama was historically termed, "Ships of the Andes". In North America we generally use the term Classic Llama or old style llama to define the working llama. These animals were extremely important to the ancient South Americans for packing goods and as draft animals. Today there is a renewed interest in using llamas for packing gear into the back country. Some forestry Services are using llamas to carry gear, due to their ability to traverse in locations not accessible by vehicle or other animals. You will find all the different types of llamas at farms on Vancouver Island. Llamas are intelligent animals that make outstanding pets and companions. They have their own individual personality and they produce a soft humming noise to communicate. 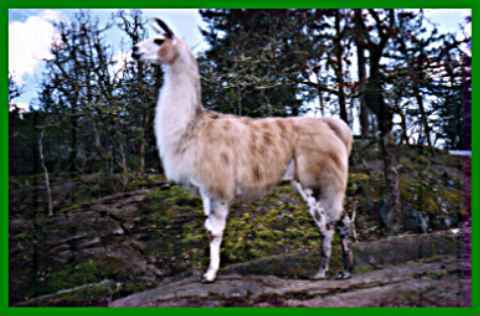 Other sounds have different meanings and books along with some web sites provide additional information on the sounds of the llama. They are curious, gentle, cooperative, quiet, and patient. The llama is an animal of flight as they are prey on the food chain. Training is easy but dependent on a relationship of trust and understanding with gentle handling and repetition. There are many good books available for training your llama. Llamas are so intelligent that a bad training experience can stay with them so it is more successful to do the reading before you start the training. The most significant contribution of llamas in Canada is the pure enjoyment of watching them graze and play on the farm or ranch. Their uses include backpacking, hiking, cart driving, livestock guards, performance and halter classes, endurance awards at pack trials, 4H, therapy and fiber. Llamas are also popular in nativity scenes at Christmas and are seen in many parades. Llamas are easily transported in vans, trailers and pick-ups. They often kush (lie down) when in transit. Llamas are extremely easy to care for regarding feed. They graze on grass or browse on shrubs and trees. On Vancouver Island hay is a requirement during the winter but not always necessary, depending on grazing land, during the summer. An adult llama will eat one 30 to 50 pound bale of hay every seven to ten days. On Vancouver Island grass hay is the hay of choice as alfalfa is high in protein and can cause problems with both too much protein and interference with calcium. Grain is used as a supplement when required, especially for pregnant and lactating females. Llamas also require minerals suitable to their needs. Incorrect minerals can be dangerous so only purchase those formulated for llamas in your area, or those recommended by knowledgeable llama owners. They need fresh water available at all times. Some protection is required against both the hot sun and winter weather conditions. In mild weather locations such as Vancouver Island llamas are fine with a three sided shelter. When locating the opening for the shelter keep in mind they should have protection from the prevailing wind. Many llama owners prefer to build a barn which can also be used for hay storage, working with animals during inclement weather, and providing a safe location for new crias. The animals like a bright barn so skylights work well for adding interior light. When possible, llamas like to sit in a high location and view the area around them. An overhang or lean to attached to the barn provides a perfect location for llamas to relax, get out of the elements and feel safe. Llamas also like to roll in the dirt or sand and a lean to with sand over the dirt provides a clean dust bath both summer and winter. 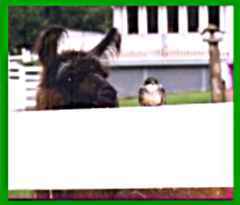 Llamas are respectful of fencing and in many cases a four foot fence is high enough to keep the llamas in. They have been known to jump a five foot fence so be certain to have a suitable height if the females are next to a stud. 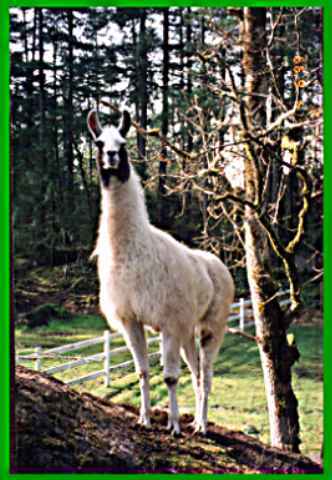 The page wire fence with a solid top rail works well and is often the fence of choice for llama owners on Vancouver Island. Fencing that is aesthetically pleasing to your property and home can often suffice for llamas. A couple of considerations are keeping dogs out with smaller wire right to the ground on perimeter fencing and not using barbed wire which may injure your animals. Some llama owners find the use of electric fencing works for both keeping llamas in and keeping predators out. The location of the hot wire is dependant on the desired use for the fence. More information is available on fencing in the many available books on llamas, which can often be borrowed from club members. Llamas are considered mature enough for breeding between two and three years of age. They grow and develop in structure until they are four years old. 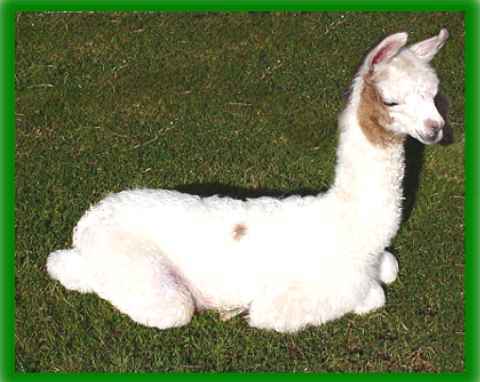 Breeding too early can prove detrimental to both adult and the cria. Llamas can be bred 12 months of the year as they are breeding-induced ovulators and a female should ovulate within 36 hours of being bred. Most people breed their llamas in the spring or the fall so offspring are born at the most suitable time of year, for their survival. The gestation period is approximately 345 days with just one offspring weighing between 22 and 30 pounds. Twins are extremely rare. The cria is quickly active and usually standing and nursing within a short time. The female does not clean the cria but does talk to it in a soft "hum". An experienced dam will nuzzle her cria and push it toward her udder or stand over it to help it find the milk. The first milk is called the colostrum and is extremely important to the survival of the cria. Llamas can be rebred two to four weeks after giving birth but it is not necessary to breed a female every year. Llamas are considered a hardy animal, and easy to raise with proper consideration given to their needs. They can be susceptible to similar diseases that affect sheep and cattle along with both external and internal parasites. Maintenance includes worming, vaccinations, toe nail trimming, and attention to nutrition. Males can develop sharp teeth called fighting teeth in their third year. These teeth may need to be dulled or removed at the gum line. This is a simple procedure generally performed by your vet. Llamas can have problems with extremes of heat and cold. Woolly animals are shorn for prevention of heat stress and fans can be placed in barns to give better air circulation. Many of the individual web sites will have references to books or other web sites with additional information on animal health. At this time there is much more involvement to import llamas into Canada than to export llamas from Canada to the U.S. When importing animals to Canada a quarantine period is required on both sides of the border, along with tests involving visits from a government approved vet. This may change to be less involved over the next few years. To export llamas to the U.S. the usual requirements are TB tests and a Brucellosis test by an approved government vet. Some states require the addition of a test for Blue Tongue disease. The vet must sign the appropriate paperwork and the animals must exit within 30 days of the date on the paperwork or be retested. 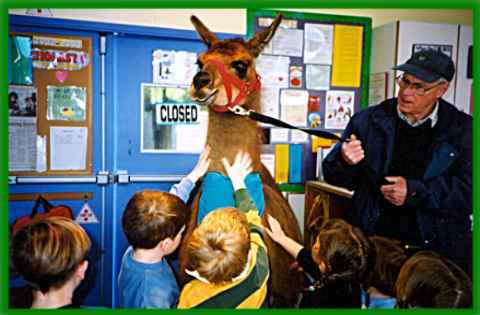 More recent changes allow Canadians to take llamas to the U.S. for up to 30 days to attend shows or other events. They require the same tests as when being exported and proper documentation must accompany the llama. At this time they cannot go into the U.S. for breeding purposes and they must go into a 14 day quarantine upon their return. Not all border crossings accept animals and the person taking the animal across the border must provide the microchip reader if the animal is microchipped. Up to date requirements can be obtained from Agriculture Canada for import and the State Vet for export.